Ingrid and I are re-watching the entire Steven Universe series — yet again — and I thought I’d blog some of my observations. Please note: I’m not writing these as a series summary or recap. I’m just writing down some of my observations and reactions, about individual episodes and the show as a whole. These posts will probably make more sense if you’ve already seen the show, but I hope they inspire the rest of you to check it out, as it really is one of the richest and most emotionally intense things I’ve seen on TV. This post contains spoilers about Steven Universe: the show as a whole, and/or about Episode 11: Arcade Mania. Kids learning that adults aren’t perfect. This is a huge amount of what Steven Universe is about. It crops up again and again: in episode after episode, Steven learns that adults make mistakes, don’t have all the information, have incorrect information, show poor judgement, are too protective or not protective enough, face difficult situations with no good answer, and have feelings and wishes and traumas of their own that make them screw up. “Arcade Mania” is striking because it’s Garnet who screws up. Generally, when Steven learns that adults aren’t perfect, he learns it from Pearl or Amethyst or Greg, or even from Rose in the stories he hears about her. 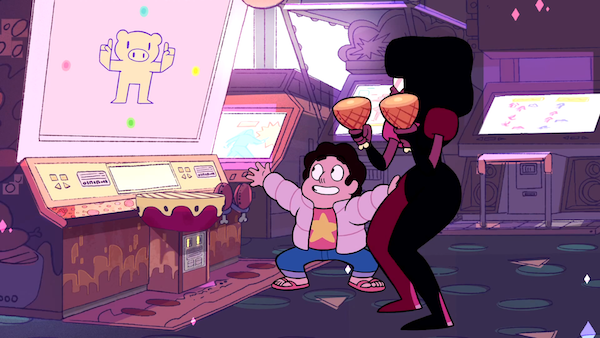 But this time, it’s Garnet who gets sucked into the arcade game, who gets so hypnotized by it that she can’t see or hear the huge fight going on behind her. This is very unlike Garnet. Of the Crystal Gems, she’s by far the most responsible, and the most balanced. But in very classic Steven form, Garnet’s weakness is the flipside of her strength. Earlier in the episode, Garnet shows that her fighting skills are tied in with her ability to go with the flow, to get lost in the action. But in a fight, there’s a natural end to the action — someone wins the fight. An arcade game can keep supplying action indefinitely. (This one can, anyway.) Garnet’s not used to that, and she doesn’t know how to adjust, or even that there’s anything to adjust to. Garnet playing the arcade game is very much like Garnet fighting — only in this case, her powerful ability to get drawn into the flow of a fight becomes a weakness, an inability to get out of the flow when circumstances demand it. Our weaknesses are often our strengths, taken to extremes, or applied in the wrong situations. I think this is very common. Our weaknesses are often the flipsides of our strengths, and vice versa. Responsible, competent people can also be self-conscious, anxious, and second-guessing. Flexible, easy-going people can be flaky. Detail-oriented people can be overly perfectionist and fixated on trivialities. Intuitive people can rely too much on intuition. Brainiacs can overthink. Our weaknesses are often our strengths, taken to extremes, or applied in the wrong situations. So I’m going to modify my thesis bit. In episode after episode, Steven learns that adults aren’t perfect — and that this is okay. Side notes: I also think it’s not an accident — SUPER SPOILER ALERT FOR PEOPLE WHO HAVEN’T SEEN THE “JAILBREAK” EPISODE — that Garnet gets sucked into a dancing game, and is so extraordinarily good at it. Dancing is how fusion happens, and we know how important fusion is to Garnet. She’s the one who’s most invested in Steven learning to fuse, and who’s most unabashedly happy when he does; she the one who gets super freaked out when she sees the creepy, non-consensual fusion experiments. It makes sense: Garnet is a fusion, all the time. It makes sense that she would care so much about it — and that a dancing game would captivate her attention. Ingrid comment: Ingrid thinks Garnet is good at this game because of her future vision. She can anticipate the dance moves before they happen, and that’s why she never makes a mistake. Also, Ingrid doesn’t like how cavalier the Gems are about the damage they do to Beach City. That shows up in a lot of episodes, and this is one of them. I’m loving these recaps now that I’m current on the show. I think you’re both right about why she can get lost in the game. She gets lost in the flow of combat because she can see the future. Often when she scans the future she has to pause because it takes some time, but in combat when she has to react in real time, she only see very shortly in the future and gets into a sort of then and now flow. It’s the same with the game. It’s making her look slightly in the future, and ONLY at what the game is going to do, so she’s focused in ‘the moment’ in the same way! Yeah, I’m hoping the gems get better about that. To a certain extent, I feel that’s a natural outgrowth of them being nigh-immortal, space aliens. How upset can a gem get about the destruction of a building that’s only been there for a mere 50 years, and would almost certainly be gone in another 50 regardless? I honestly feel like the gems don’t really understand why humans would be so upset about it. And maybe its’ also a reminder to us that no matter how human the gems seem, they aren’t human. While there’s some overlap in our values, it’s not complete. And most of the humane things the Crystal Gems value are things they learned in their “recent” (only 5000 years ago) past from Rose, or within the last 10 years from Steven. Yet another reason I love this show. So much depth, so many angles to examine everything from.